Who should not take Trimipramine MALEATE? What conditions does Trimipramine MALEATE treat? Tell your doctor right away if any of these unlikely but serious side effects occur: fainting, mental/mood changes (e.g., confusion, depression, nervousness), numbness/tingling of the hands/feet, ringing in the ears, sexual problems, shakiness (tremors), severe vomiting/constipation. Tell your doctor right away if any of these rare but very serious side effects occur: severe headache, pain/redness/swelling of arms or legs. Get medical help right away if you have any very serious side effects, including: slow/fast/irregular heartbeat, severe dizziness, fainting, seizures, slurred speech, weakness on one side of the body, eye pain/swelling/redness, widened pupils, vision changes (such as seeing rainbows around lights at night), chest pain, jaw/left arm pain. This medication may rarely cause serious blood problems (e.g., agranulocytosis, thrombocytopenia) or liver problems. Tell your doctor right away if you notice any of the following rare but very serious side effects: easy bleeding/bruising, signs of infection (e.g., fever, persistent sore throat), severe stomach/abdominal pain, dark urine, yellowing of the eyes/skin. List Trimipramine MALEATE side effects by likelihood and severity. Before using this medication, tell your doctor or pharmacist your medical history, especially of: blood problems (e.g., agranulocytosis, thrombocytopenia), breathing problems (e.g., asthma, chronic obstructive pulmonary disorder-COPD), diabetes, electroshock therapy, personal or family history of glaucoma (angle-closure type), heart problems (e.g., recent heart attack, arrhythmias, coronary artery disease), intestinal problems (e.g., chronic constipation, ileus), kidney problems, liver problems, other mental/mood conditions (e.g., bipolar disorder, psychosis), family history of mental/mood conditions (e.g., suicide, bipolar disorder), seizures, conditions that may increase your risk of seizures (e.g., bulimia, organic brain disease, alcohol withdrawal), overactive thyroid (hyperthyroidism), problems urinating (urinary retention, enlarged prostate). The risk of QT prolongation may be increased if you have certain medical conditions or are taking other drugs that may cause QT prolongation. Before using trimipramine, tell your doctor or pharmacist of all the drugs you take and if you have any of the following conditions: certain heart problems (heart failure, slow heartbeat, QT prolongation in the EKG), family history of certain heart problems (QT prolongation in the EKG, sudden cardiac death). What should I know regarding pregnancy, nursing and administering Trimipramine MALEATE to children or the elderly? Some products that may interact with this drug include: anticholinergics (e.g., atropine, belladonna alkaloids), clonidine, certain drugs for high blood pressure (e.g., guanadrel, guanethidine, reserpine), drugs affecting liver enzymes that remove this medication from your body (e.g., cimetidine, haloperidol, protease inhibitors such as fosamprenavir/ritonavir, drugs that affect heart rhythm such as flecainide/quinidine/propafenone), drugs for motion sickness (e.g., meclizine, scopolamine), thyroid medication. Check the labels on all your medicines (e.g., cough-and-cold products, diet aids, motion sickness) because they may contain drowsiness-causing ingredients, drying agents (anticholinergics) or stimulants/nasal decongestants that could increase your heart rate or blood pressure. Ask your pharmacist about the safe use of those products. Does Trimipramine MALEATE interact with other medications? 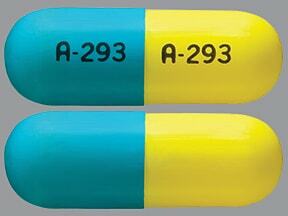 This medicine is a yellow light blue, oblong, capsule imprinted with "A-293" and "A-293". 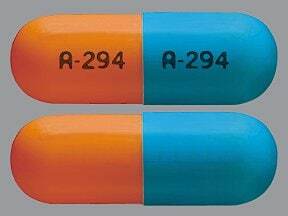 This medicine is a medium orange light blue, oblong, capsule imprinted with "A-294" and "A-294". 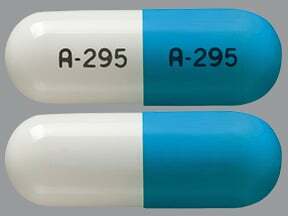 This medicine is a light blue white, oblong, capsule imprinted with "A-295" and "A-295". 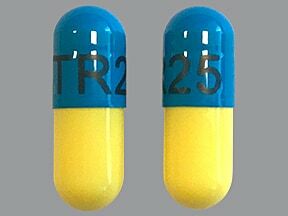 This medicine is a yellow blue, oblong, capsule imprinted with "TR25". 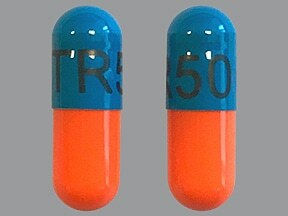 This medicine is a orange blue, oblong, capsule imprinted with "TR50". 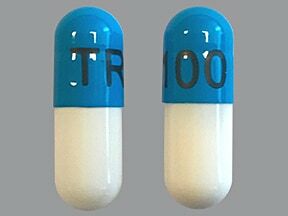 This medicine is a light blue white, oblong, capsule imprinted with "TR100". Are you taking Trimipramine MALEATE? Are you considering switching to Trimipramine MALEATE? How long have you been taking Trimipramine MALEATE?